The cabins are individually decorated. The beds were great and it was clean. We had a hot tub/hot pot located in the middle of the cabins was just the way to relax after a long day on the road. We saw the Northern Lights from our patio that evening. Everything. Perhaps what was most exceptional, besides the cottage itself, was the staff. They were flexible and understanding when we were having trouble making our reservation due to inclement weather. They were fantastic. From the moment you arrive to the property, you know you are somewhere special and well cared for. Cabins are situated around (not tightly) around a very picturesque hot pot. The cabin interiors are dreamy and obviously are the result of love and pride. This was our absolute favorite place in our 3 weeks in Iceland. Adorable little cottage, fully equipped. Beautiful view of mountain scenery and Northern lights. Stone hot tub fed by natural hot spring. 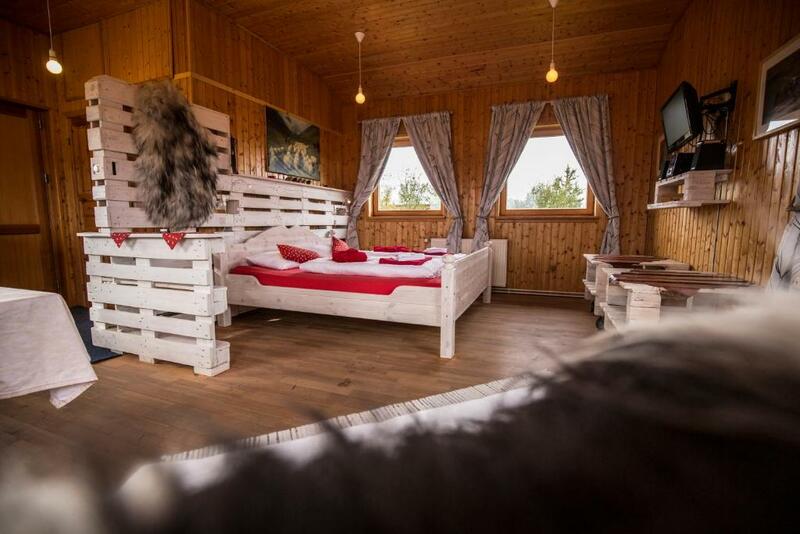 This was our favorite accommodation in Iceland! We wished we could have stayed more than one night. Everything! Wish we had booked more nights at the cottages. They were perfect! I love this place so much! Stayed here before and wish I could just live there. Super cute cottages and love the hot pot and horses. So cozy! Can’t wait to stay again! They were very accommodating to your family. We were traveling with our 2 year old. They reached out to us and set up a crib for her. Our cottage was larger than we expected, very clean and it was decorated in a tastefully done country sheep theme. We had a collapsible cooler that we brought with us so we stopped at a nearby grocery store and stocked up and cooked a wonderful meal in our cottage. The hot spring pot was very relaxing after a long day of hiking. We got to meet some of the other guests and we talked about some of the things they had seen and done. You pick up your key at a different location...pay attention to their instructions. It all went smoothly for us. We did a 11 day trip around Iceland and this was one of our top 3 places we stayed! The owner is friendly and helpful, and his dog is adorable! The cottages are cute, clean, comfortable, and in a beautiful setting. A good spot to stay if you want to take day trips to the Highlands, Akureyri, or explore the Tröllaskagi Peninsula. Bonus points for the hot pot! 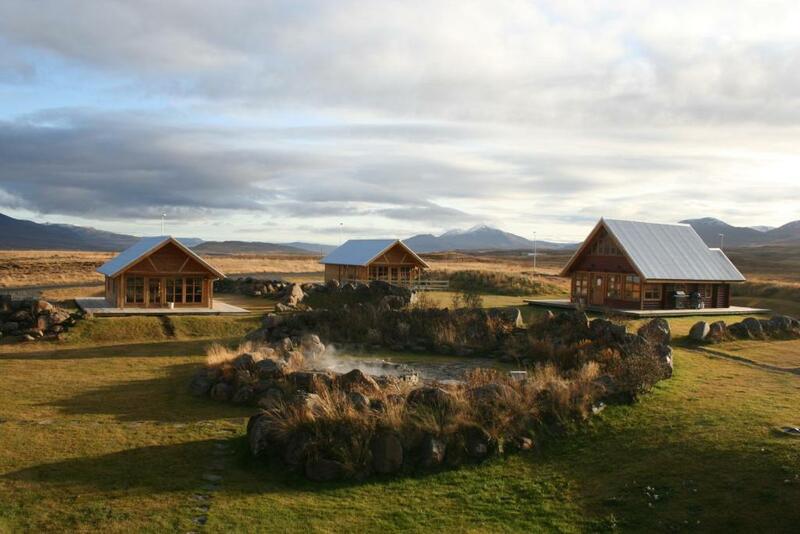 When planning my return trip to Iceland, staying at Hestasport again was #1 on my list. If I could move in, I would. Lock in a great price for Hestasport Cottages – rated 9.5 by recent guests! 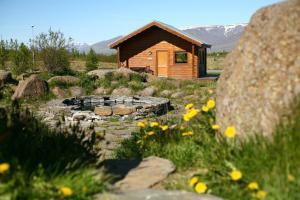 Hestasport Cottages is located by a geothermal hot pot, 0.6 mi outside Varmahlíd village. 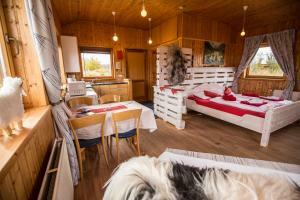 It offers modern, self-catering accommodations with free Wi-Fi, full kitchen facilities and a patio. The wooden cottages at Hestasport have microwaves, tea/coffee makers and fridges. Dining tables and sofas are also included. Each cottage has a private bathroom with a shower. The communal, natural outdoor hot tub is ideal for an evening of relaxation. Icelandic horse riding tours and white water rafting trips can be arranged. A supermarket, petrol station and tourist office are a 2-minute drive from Hestasport’s cottages. This property also has one of the top-rated locations in Varmahlid! Guests are happier about it compared to other properties in the area. This property is also rated for the best value in Varmahlid! Guests are getting more for their money when compared to other properties in this city. When would you like to stay at Hestasport Cottages? This cottage features an open-plan space with a full kitchen and private bathroom. Modern, wood-paneled cottage with an open-plan kitchen/living room and a separate bedroom. With magnificent views overlooking the vast plains and distant mountains of the Skagafjörður valley, our seven charming timber cottages are the ideal place to spend your days off all year round. 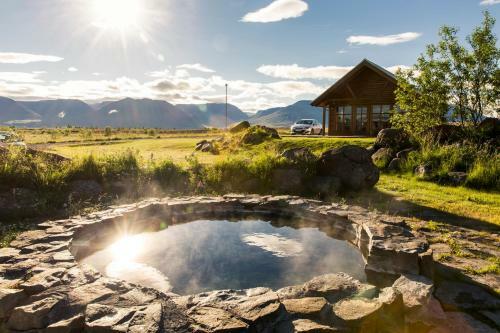 From the hot tub at the centre of the well-maintained cottage site, you can enjoy the golden light of the midnight sun or watch the northern lights. I enjoy going for long rides through our beautiful valley or up to the mountains to gather the sheep in fall. I grew up in this area and would love to give you some inside information about the nicest spots around here. Skagafjörður offer different activities, either for outdoor persons who wants to experience the famous "tölt" of the Icelandic horses and go rafting on glacial rivers, or for people who prefers to lay in some wild hot-springs for hours. 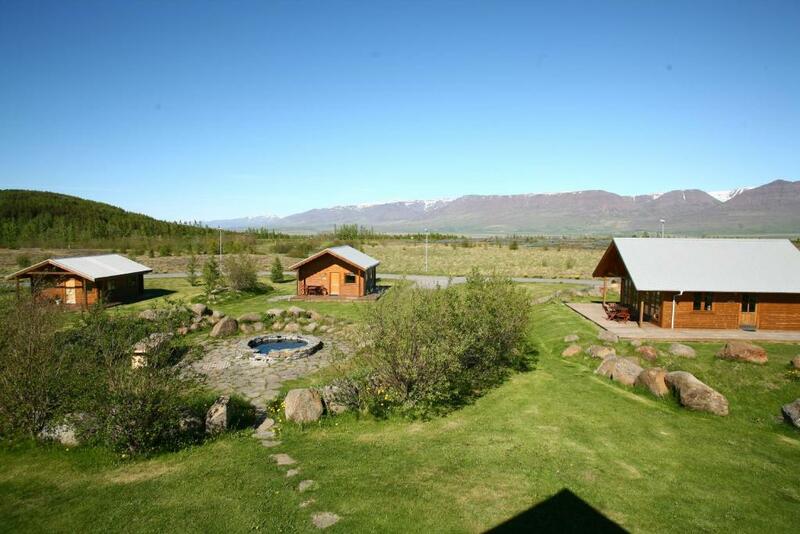 Our cottages are nestled together up on the hill only a short walking distance from the centre of Varmahlíð. In town, you will find all the services you need: tourist information, grocery shop, restaurant, petrol station, bank, hotel, swimming pool, and more. House Rules Hestasport Cottages takes special requests – add in the next step! Hestasport Cottages accepts these cards and reserves the right to temporarily hold an amount prior to arrival. Please note that cottages are 1.2 mi away from the reception office. The GPS coordinates are not always accurate for this area. You should use the following GPS coordinates to arrive at the reception: N 65°32,744' W 19°26,338. Alternatively, you can contact the hotel for directions. Check in is possible at any time, but guests arriving after 18:00 need to notify the hotel about their anticipated arrival time. Parking space is provided directly next to the cottages. 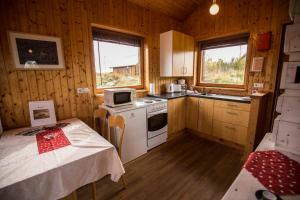 Guests can have breakfast at Hótel Varmahlíð, 0.6 mi from the cottages, at an additional cost. Please inform Hestasport Cottages of your expected arrival time in advance. You can use the Special Requests box when booking, or contact the property directly using the contact details in your confirmation. Please note that check-in and key collection take place at: Hestasport Check-in, road no. 752, Varmahlið 561. The bed consisted of two matresses, which was a bit uncomfortable. It would be nice to have something in the shower to put the shampoo on. The outside lights of the other cottages were on even when not occupied which was a bit bothersome. But these are just very minor points. Very lovely cottages. The hot pot is great with perfect temperature and wonderful view of the skies. The cottages are decorated very nicely, we had the sheep cottage (fjarhus). There is everything necessary to do some cooking including a microwave, a fridge and stoves and even an oven. The bed is quite big. It feels very cozy. We liked the remote location, with still a gas station with a small shop close by to get anything important. Very cosy little house at a great location! Great hot tube, absolutely amazing place and surrounding. Wooden cottages are so warm and cosy. The best place to stay in Iceland! Loved everything about this cottage. Absolutely coming back. The day we arrived was very windy and bit cold, so i turned the heater up , on next to the bed wasn't working at all, the one in the bed room used to dry the towels was making lot of noise when turned up over level 3. but wasn't a big issue i just turned it down to 2. i think a little maintenance will be good. i would have recommend a washer machine for people that would like to stay longer. The place was really clean , the stuff were pleasant,. the welcome basket is very nice touch . The hot tub which was amazing after our drive through a snow storm. It was the place where we saw the northern lights too.